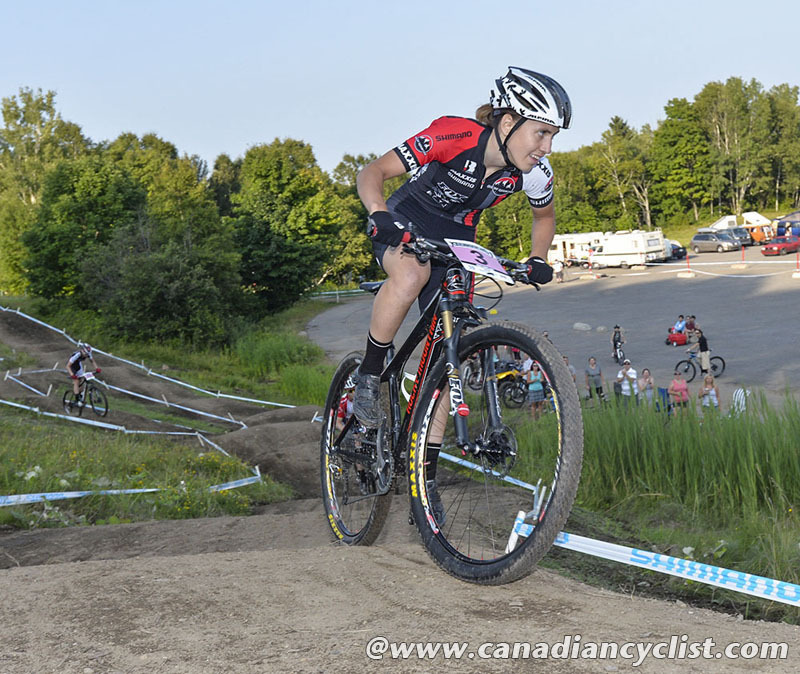 Round four of the Eliminator series in the UCI Mountain Bike World Cup saw new riders take over the lead in the overall standings for both men and women at Mont Ste Anne, Quebec, Canada. Fabrice Mels (Salcano Alanya) donned the leader's jersey for the men, while Kathrin Stirnemann (Sabine Spitz Haibike) became the women's leader. 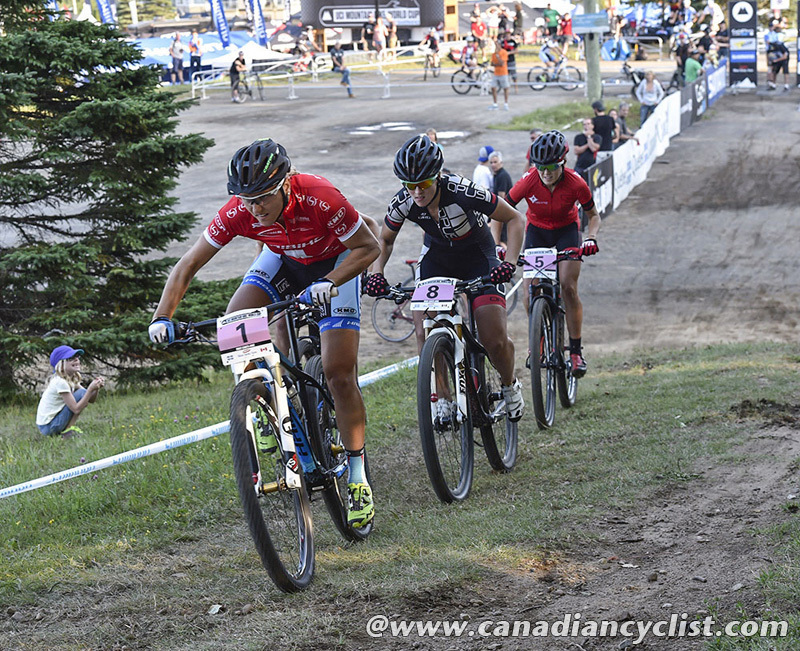 Canada had a large number of entries, with Andreane Lanthier-Nadeau (Rocky Mountain) the top finisher, making the women's final and podium in fourth place. 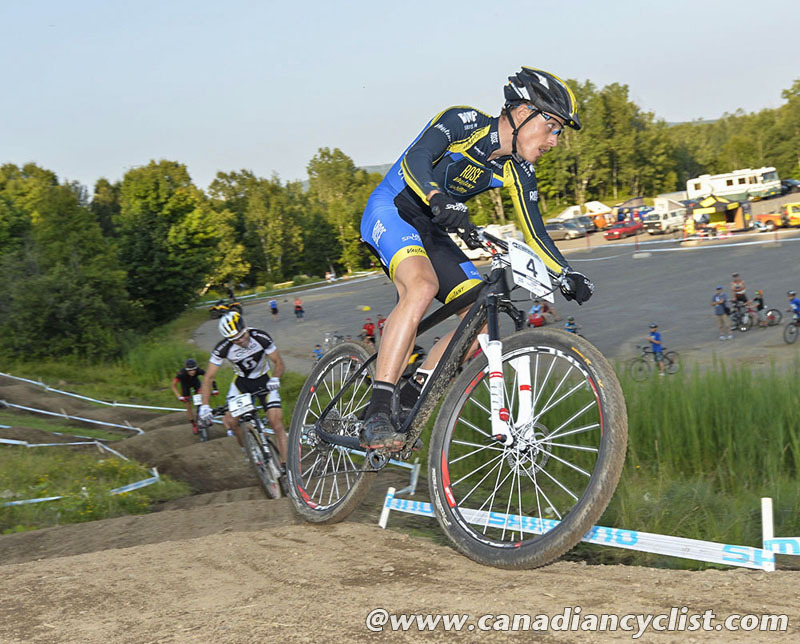 Samuel Tremblay (Canadian National) made the men's small final to finish seventh. 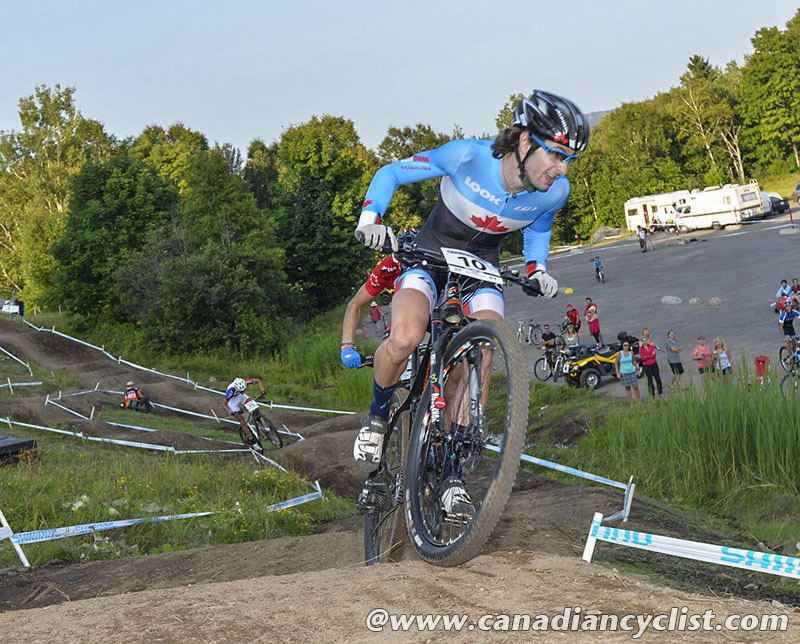 Surprisingly, this was the first time that Mont Ste Anne had hosted an Eliminator and, in true MSA fashion, they made it tough, with a long opening climb, BMX descent and then a pumptrack section before the sprint to the finish. On Switzerland's national day, Swiss rider Kathrin Stirnemann celebrated by winning the fourth round. Stirnemann took the leader's jersey in the absence of former leader Alexandra Engen (Ghost Factory), who did not race. Stirnemann was clearly the strongest, qualifying fastest and winning both of her heats on the way to the final. Jenny Rissveds (Scott -Odlo), after qualifying second did the same on the other side of the draw. Lisa Mitterbauer (Feenstra Felt p/b Kenda) and local Canadian hope Andreane Lanthier-Nadeau were the other two riders to make up the final heat. Stirnemann rode from the front to win solo, with enough time over Rissveds to roll across the line with her arms in the air. Mitterbauer took third. "I just felt great the whole day, and already in the morning it was good," said Stirnemann. "I think the start was the most important part here. I got the hole shot and made it to the finish, so I'm super happy to take the win. It was perfect to get the jersey today. It's sad to miss Alex, so I hope she will get well." "For me the goal was to make the final," said Lanthier-Nadeau. 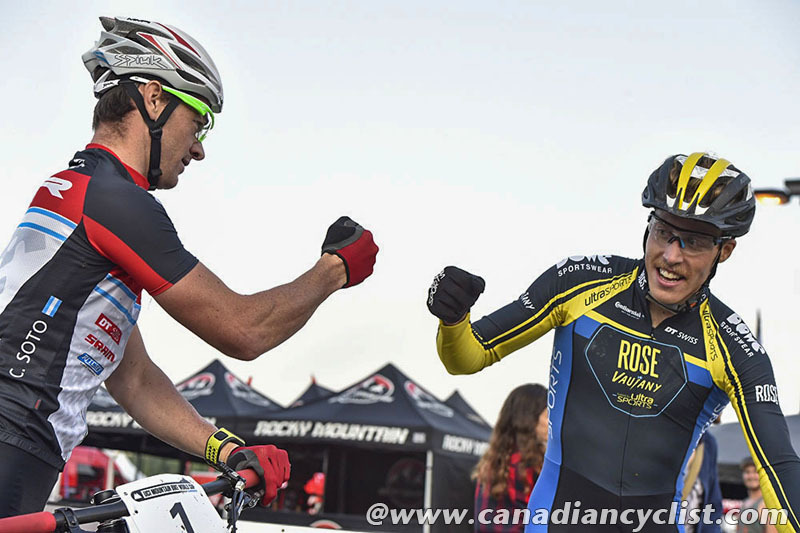 "My national championship race did not go so well with a crash, but I knew that I had good form. I've had good results at the Junior [cross-country] in the World Cup before, but this is a whole different level, so I'm really happy." Stirnemann now leads the women's standings with 185 points, followed by Engen at 160 and Rissveds at 100. Lanthier-Nadeau is the top Canadian in seventh with 41 points, followed by Andreanne Pichette (Opus) in 14th with 24 points and Rachel Pageau (Canadian National) in 18th with 18 points. The men's final was filled with drama, including a crash that took two riders out of contention, enabling German rider Simon Gegenheimer to win the second Eliminator of his career. Fabrice Mels, despite crashing, took over the leader's jersey from Paul van der Ploeg, who did not make the final. Gegenheimer and Mels were joined in the final by Catriel Andres Soto (MMR Bikes), the fastest qualifier, and defending World Cup champion Daniel Federspiel (Otztal Scott). Federspiel went to the front early in the final race, but went down after his front wheel washed out, effectively bringing the race to a halt, as the three following riders tried to get by Federspiel and he attempted to get going again. In the confusion, Federspiel's saddle got tangled with Mels' rear wheel, and by the time they had sorted it out the other two were long gone, with Gegenheimer winning the sprint. "It was a really hard final," commented Gegenheimer. 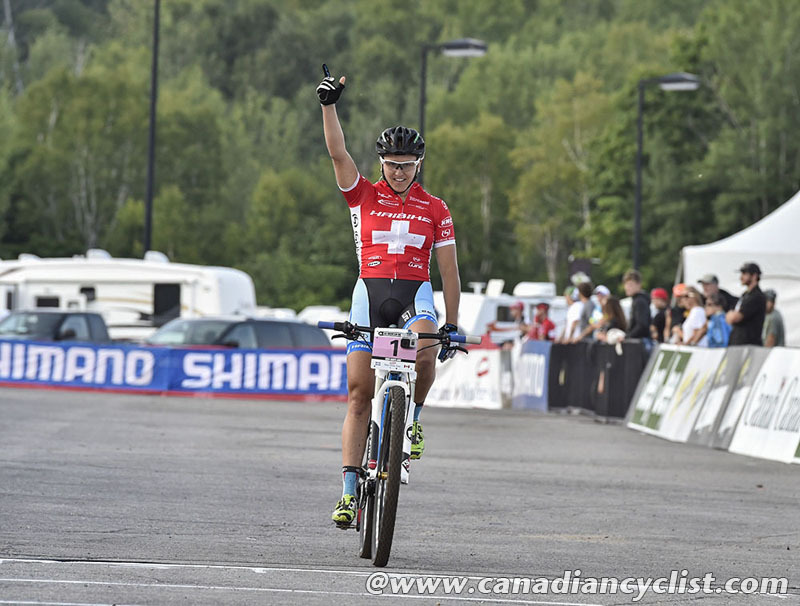 "Last year I won the final round in Hafjell [Norway], and it is an amazing feeling to win again. But it will be hard to get back into the race for the overall title, since the beginning of the season did not go well for me. So I think the series is over for me, but I will fight for some more wins." Tremblay was clearly one of the fastest starters, winning his opening heat against friend and Canadian national champion Leandre Bouchard (Cyclone d'Alma Devinci), and then taking second to Federspiel in the quarterfinal to move into the semifinals. In his semifinal, Tremblay moved into the lead on the opening climb, but didn't have the endurance to maintain it, and finished third behind Mels and Federspiel. Mels now leads the overall standings with 127 points, followed by van der Ploeg at 118 and Federspiel at 105. Bouchard remains the top Canadian, in ninth place with 33 points, followed by Tremblay in 18th with 16 points.